Men's long sleeve T-shirt from KENZO. 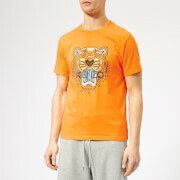 Cut from pure cotton with a relaxed fit, the top features a ribbed crew neck and long sleeves with iconic KENZO logo to the outside of the left sleeve. Complete with a straight hem and tonal, triangular stitch detail to the nape.